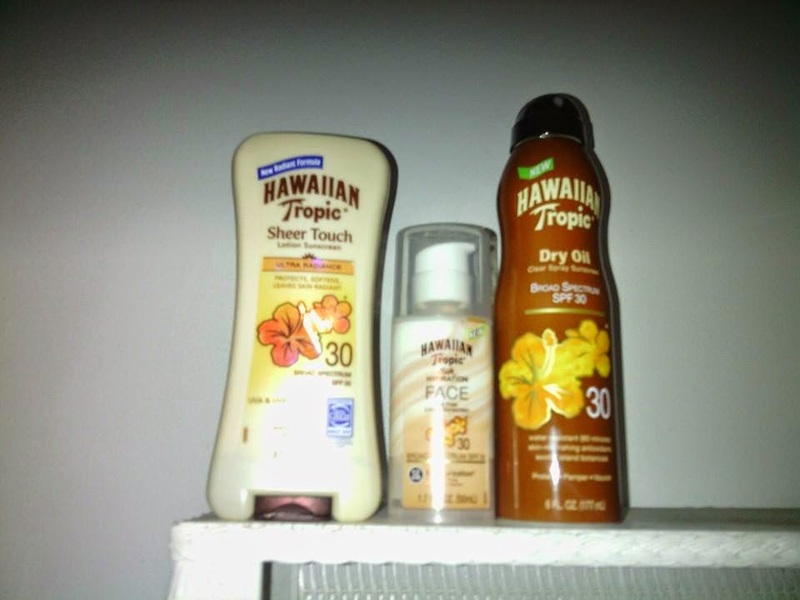 Recently I had the opportunity to try 3 new products by Hawaiian Tropic. Living in Florida, and taking 7 kids to the beach (which we do almost daily in the summer!) we have to have the right sunscreen. Not only for the kids, but for the moms too! I have always loved Hawaiian Tropic. I grew up with my mom using the tanning oil, and I remember her laying out on the patio tanning back in the early 80's...so the scent of Hawaiian Tropic always takes me back to my childhood. The scent is very reminiscent of Hawaii too..it's coconut-ty and just SMELLS like sunshine. luxurious feel and light tropical scent, Hawaiian Tropic® Silk Hydration™ SPF 30 Face Lotion Sunscreen nourishes and pampers skin while providing broad spectrum UVA and UVB protection. Hawaiian Tropic® Silk Hydration™ SPF 30 Face Lotion Sunscreen is specially formulated for use on facial skin, with a lightweight, oil-free and non-greasy formula that won’t clog pores. Oil-Free Moisturization: With hydrating ribbons that contain luxurious silk protein and rich Shea Butter, Hawaiian Tropic Silk Hydration™ SPF 30 Face Lotion Sunscreen provides both protection and 12-hour moisturization. Nourishing Protection:Hawaiian Tropic® Silk Hydration™ SPF 30 Face Lotion Sunscreen provides safe and effective broad spectrum UVA and UVB protection that won’t break down in the sun. Plus, the formula contains nourishing antioxidants and exotic island botanicals that pamper skin. Availability: Hawaiian Tropic® Silk Hydration™ SPF 30 Face Lotion Sunscreen is available nationally and online at mass, grocery and drug retailers for a suggested retail price of $8.99. New Hawaiian Tropic® SPF 30 Dry Oil Clear Spray Sunscreen gives skin the luxurious feel and scent of an oil with UVA and UVB broad spectrum protection in an easy-to-use spray format. With a formula that contains indulgent oils and vitamins, this Dry Oil Clear Spray Sunscreen keeps skin ultra-soft, moisturized and glowing in the sun. Ultra-Moisturization: Hawaiian Tropic® SPF 30 Dry Oil Clear Spray Sunscreen contains indulgent oils, botanicals, vitamins and Aloe Vera to soften skin. Its classic Hawaiian Tropic coconut fragrance offers the fully indulgent experience of an oil, while providing broad spectrum SPF 30 protection. Quick and Easy Application: Hawaiian Tropic® SPF 30 Dry Oil Clear Spray Sunscreen is in an easy-to-apply format that goes on clear for quick and even coverage. Its non-drying formula keeps skin soft, healthy and glowing every moment in the sun. Availability: Hawaiian Tropic® SPF 30 Dry Oil Clear Spray Sunscreen is available nationally and online at mass, grocery, and drug retailers for a suggested retail price of $8.99. New Hawaiian Tropic® Sheer Touch Ultra Radiance Lotion Sunscreen is our first sunscreen that protects, softens and leaves skin radiant. Offering broad spectrum UVA and UVB protection with an innovative formula of guava, papaya and plumeria extracts, Sheer Touch Ultra Radiance delivers a luxurious skin feel and leaves skin noticeably soft and luminous. Superior Skin Feel: Hawaiian Tropic® Sheer Touch Ultra Radiance Lotion Sunscreen is non-greasy with a rich, luxurious formula made from an exclusive blend of guava, papaya and plumeria extracts that will leave skin noticeably softer. Natural Luminosity: Special pigments that reflect light yield a soft, luminous effect, causing skin to appear beautiful, radiant and glowing. Availability: Hawaiian Tropic® Sheer Touch Ultra Radiance Lotion Sunscreen in SPF 50, 30 and 15 is available nationally and online at mass, grocery and drug retailers for a suggested retail price of $8.99.